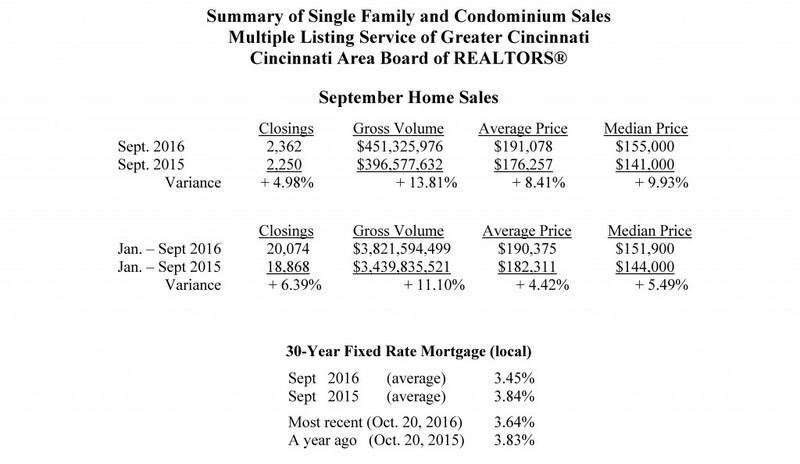 | Greater Cincinnati Home Sales Remain Strong! September home sales remained strong, up 5.00 % compared to a robust September a year ago. September home sales were 2,362 compared to 2,250 in September 2015. For the first nine months of 2016, home sales are up almost 6.4% over the first nine months of 2015. “Being a very stable and affordable housing market, Greater Cincinnati continues its upward sales trend,” said Patti Stehlin, President of the Cincinnati Area Board of REALTORS®. “Our closings in September have been their highest since 2005,” said Stehlin. Nationwide, September home sales were up + 3.2 % from August on a seasonally adjusted basis, and were up + 0.6 % from September 2015.